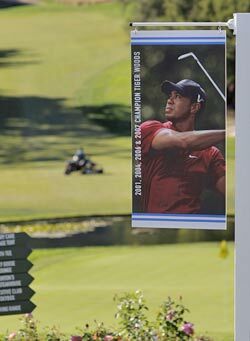 Steve Elling Article on Tiger Woods - Wilson Law Firm P.L. The case of the people vs. Tiger Woods. Being an Orlando-based defense attorney who handles cases ranging from criminal to vehicular, Wilson’s interest probably ranks a bit higher than most. Yet his expertise on how legal matters are handled in the area ranks far greater than we civilian types, to be sure. Turns out, this whole thing looks flimsier than a wet tortilla. The way Wilson sees it, even if the Florida Highway Patrol is hopping mad about being stonewalled and has David Caruso and Laurence Fishburne tracking the investigation, Woods is likely facing the legal and social equivalent of a one-shot penalty. As always, the gulf between what is assumed and what’s provable and admissible in court is longer than a PGA Tour-sized par-5. Woods is probably facing nothing more than a civil charge for careless driving, which might carry a small fine and could cost him a few points off his driving record. Then again, if his record is clean, Florida has a statute that allows for adjudication to be withheld, which means it’s not even a slap on the wrist for the world’s first $1 billion sports figure. Since Woods is under zero obligation to provide the FHP with details of the events of Friday morning, there will be no public-record counting, no play by play, and it’ll die a quiet, lonely death. Woods on Monday withdrew from this week’s Chevron World Challenge, which means we won’t likely see or hear from him for two months. As reports circulated Monday that FHP was seeking to subpoena Woods’ medical records, it’s debatable what those records would prove and what the courts would rule to be admissible. Between lunchtime nibbles, Wilson casually shot down most of the assumed pitfalls that Woods might be facing. Reckless driving is a criminal offense in Florida, used when drivers put others in danger. “As for reckless driving, who is going to testify as to his driving pattern?” Wilson said. “You have to look at witnesses, not the speculation. Everybody wants to say that because this occurred at that time of night and he was on the ground with injuries, this or that must have occurred. You can’t use speculation to prove a case. What did people actually see?” “I mean, do they actually believe his wife is going to testify against him? That is not going to happen. Reckless driving is a criminal citation and it’s something I don’t think they will be able to show here. I think they will have a hard time showing careless driving, even. Then there’s the specter of possible DUI charges. The public has raged about how Woods hopped a curb on the wrong side of the street at 2:30 a.m., taking out a hydrant and a tree. He was semi-conscious and mumbling when the Windermere Police arrived. It was the wee hours after Thanksgiving Day, when holiday revelers have been known to down a pint or two. Had it been you or me, they would have had us in cuffs for suspicion of intoxication, right? Woods was never tested. Good luck catching up on that front, sleuths. “From what I understand, he was outside the vehicle when officers arrived,” Wilson said, accurately repeating the Windermere PD version. “One of the key things in a DUI is they have to put you behind the wheel of a vehicle. “While we all know he was the driver of the vehicle, it’s a whole different ballpark when you are in court. My understanding is that there are no direct eyewitnesses who can place him in the car. It doesn’t much matter what Woods might have mumbled, if anything. In Florida, somebody involved in a wreck is granted an immunity of sorts as authorities compile the initial accident statement. “An accident victim can make a report to authorities and it cannot be held against him, something called accident report privilege,” Wilson said. What about media speculation that a domestic issue involving Woods’ wife, Elin, proceeded the accident? Good luck, FHP. They are going to need it. Let’s recap, shall we? “They have nothing to put him behind the wheel, to my understanding,” Wilson said. “They have no [reckless] driving pattern, no evidence to indicate he was under the influence of anything, and yeah, we can all believe because of what happened that, of course, something is screwed up. You don’t just hit a fire hydrant and a tree at that time of the morning and then end up unconscious and lying in the street. Wilson was asked whether he would have similarly advised Woods to duck for cover and to avoid FHP investigators, which is within Woods’ legal prerogative. Wilson, who has both a juris doctor diploma and a master’s degree in business hanging on his office wall, almost laughed. “I believe this is the smart play,” he said. “You make your statement with regard to anything you want to address, and he did a great job issuing a written statement [Sunday] that sounded very sincere and it should help him keep his good name.